When I go out to a good Italian restaurant I am likely to order something with a cream based sauce rather than a tomato sauce. I think it is because I don’t make cream based sauce at home that often and if I can’t see how much butter, cream and cheese they are putting in to the pasta, then it’s not there. Right? This recipe is neither cream based nor tomato based but is packed full of flavor and is on the table in under 30 minutes! I infuse the olive oil with garlic before I get cooking. This is easy, while you are waiting on the oil to heat in the pan, just take two cloves of garlic, that have been sliced lengthwise, into the oil, cut side down. Once the oil starts to heat up it will begin to cook the garlic. Right before you cook the chicken, take the garlic out. At this point it will have flavored the oil and will be fragrant. 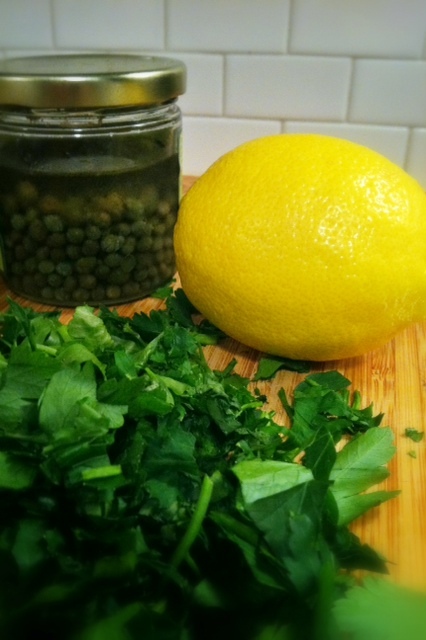 You could also use garlic olive oil, if you have it. 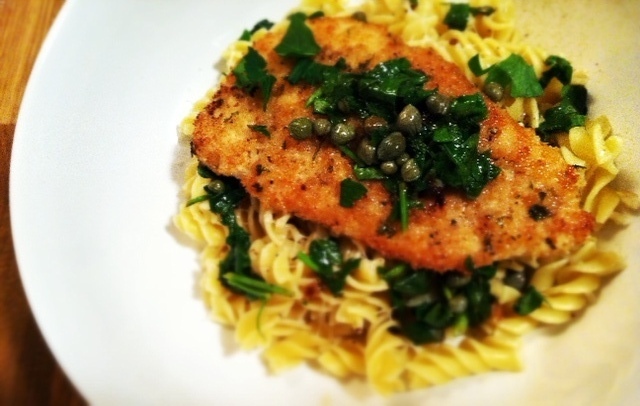 Using chicken cutlets helps with quick cooking and fast flavor. Spread breadcrumb mixture over a plate. Using regular breadcrumbs and panko together is key. This ensures a lot of breadcrumbs stick to the chicken and helps it achieve maximum crunchiness. 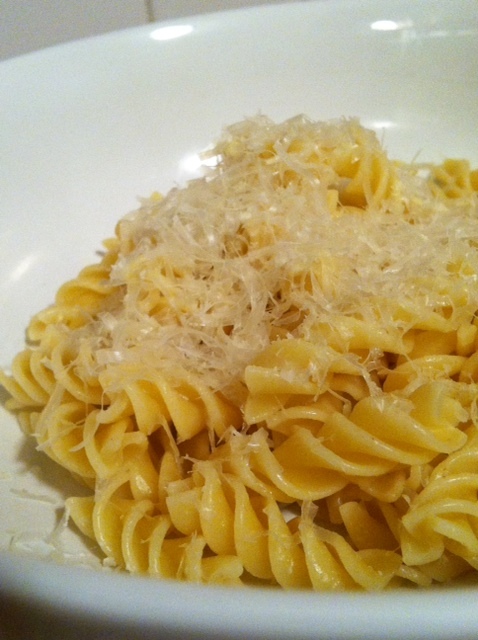 I used rotini because I had it in the pantry already. 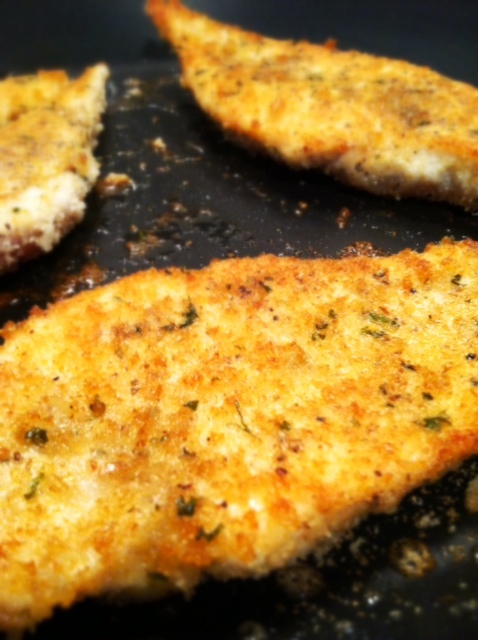 Topping with parmesan cheese before you lay the chicken on top of it helps it melt to its full potential. Top with chicken and sauce. 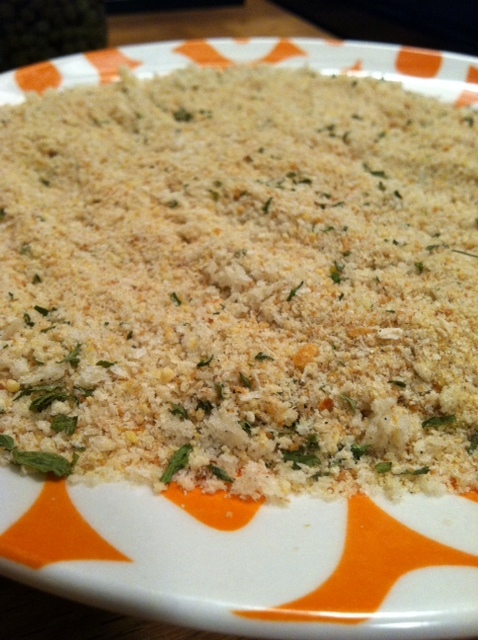 Combine breadcrumbs and lay evenly on a plate. 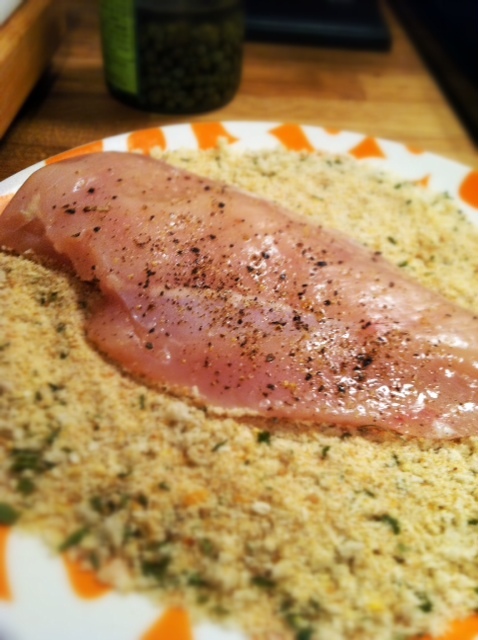 Sprinkle chicken evenly with salt and pepper; dredge in breadcrumbs. Cook half of chicken in 1 tablespoon hot oil (that has been infused with garlic) in a large nonstick skillet over medium-high heat 2-3 minutes on each side or until golden brown and juices run clear. 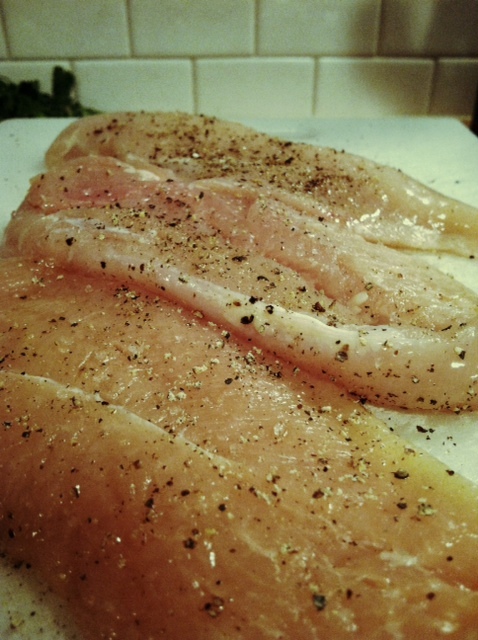 Remove chicken to a serving platter, and cover with aluminum foil. Repeat procedure with remaining chicken and 1 tablespoon olive oil. Don’t layer chicken or it will sweat. 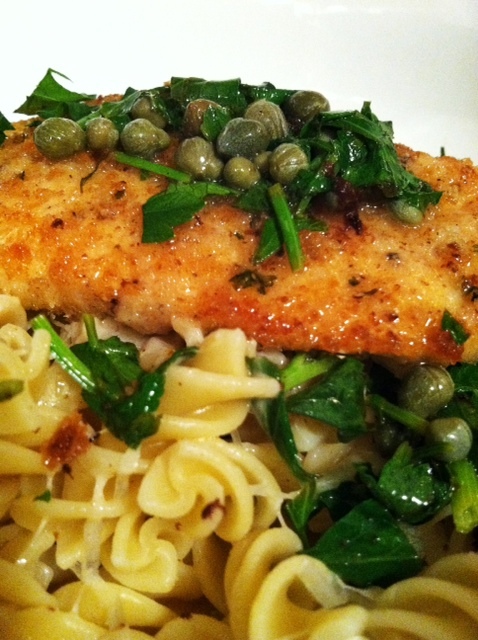 Once all the chicken has been cooked and removed from pan, add broth, capers and lemon juice to skillet, and cook, stirring to loosen bits from the bottom of the skillet, until sauce is slightly thickened. 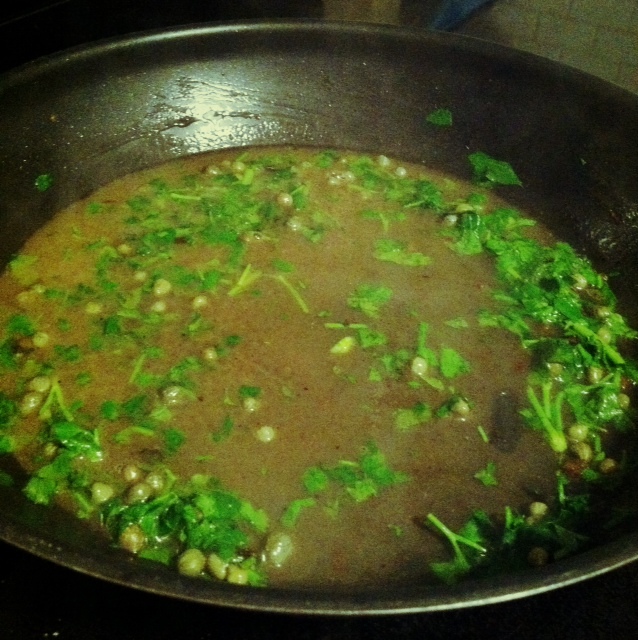 Remove from heat; add butter and parsley, stirring until butter melts. Season with salt and pepper. Pour sauce over chicken, and serve over warm noodles.